Published Oct 22, 2012 by Addison-Wesley Professional. Part of the LiveLessons series. Tackling the question, “What mindsets need to change?” this lesson reveals the six key mindsets from plan-driven management that need to be upgraded to do agile well and meet the reality of today’s business environment. This lesson stares some long-held beliefs in the face and holds them up to the stark light of day, so take it easy as you work through the lesson. “What behaviors need to change?” is the central question of this lesson in which you work with the critical skills of self-awareness and self-management as well as learn the specific agile-enabling behaviors you need to adopt to do well as an agile coach. 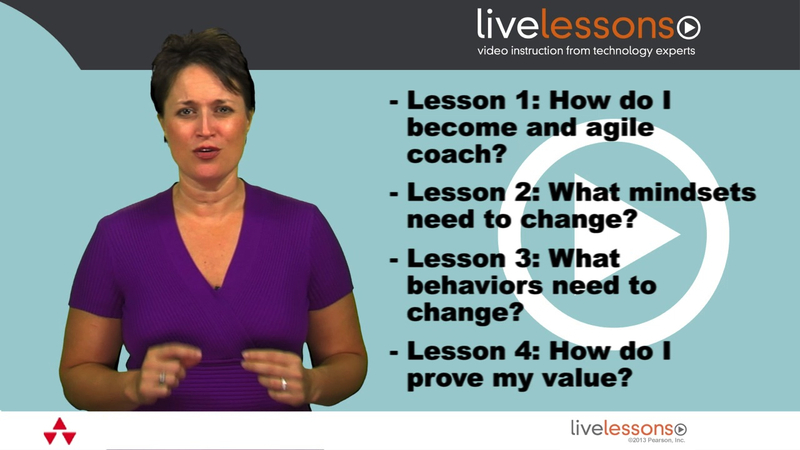 This lesson tackles the question on many agile coaches’ minds, “How do I prove my value?” In this lesson, you learn how to measure your value as an agile coach, know where you are in your own journey toward becoming a great coach and be able to recognize and speak to the specific value you add. “How do I help the agile roles become fully occupied?” is the rocky terrain covered in this lesson. We go role-by-role so you can learn how to develop other ScrumMasters/agile coaches as well as help product owners and managers step fully into their roles so that agile can work well. As we explore the question, “How do I make agile meetings purposeful and productive?” you learn how to facilitate the agile meetings so that they achieve their full purpose and productivity. We go meeting by meeting and get specific about how to facilitate stand-up, sprint planning, sprint review and retrospectives. This lesson also introduces you to the facilitation mindset and teaches you how to take that mindset on as you help each meeting be completely useful. Cooperation and collaboration are the subject of this lesson as we explore the question, “How do I help the team come up with great ideas?” In this lesson, you learn how to help the team see the difference between cooperation and collaboration. You learn how to teach them to be good individual cooperators and, if needed, how to build their own collaboration muscle.